Iron Wok Jan! is of my favorite comfort food manga, and yes, the play on words is intentional. Comfort food manga is basically any manga that if you know the basic plot, you can pretty much pick up any volume and enjoy. A lot of Rumiko Takashi works fall into this category, such as Ranma ½ and Mermaid Scar. Of course, it is better to read the volumes in order, but if you want to casually check out a series, or read something that's just fun and doesn't require a lot of thinking, comfort food manga can't be beaten. The basic plot of Iron Wok Jan! concerns a young chef called Jan Akiyama. He comes from a long line of chefs, and the Akiyama name is well known in the world of Chinese cuisine. He works in the Gobancho restaurant, alongside the exotic Celine Yang, and the novice chief Okonogi. Also working at Gobancho is Kiriko Gobancho, the restaurant's owner's granddaughter and a very skilled chef in her own right. Kiriko and Jan are constantly locked in battle, as the two have very different philosophies towards cooking. Jan believes that cooking is a competition to prove who the best chef is, while Kiriko believes that cooking is about the heart and satisfying the customer. 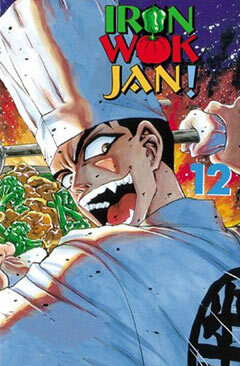 They get plenty of chances to pit their beliefs and cooking skills against each other in various cooking tournaments, but by volume twelve, things seem to have calmed down at the Gobancho restaurant. Well, not quite. It's important to point out that Jan is a real jerk. In any other series, he'd be the villain, but seeing as he's the title character here that's not the case. He'll use every dirty trick short of actual cheating to win. So how do you get the readers to cheer for a guy who's practically a demon? Pit him against someone even worse, perhaps someone like Suguru Yumizu, a spoiled rich kid who, just like Jan, has to win at everything. After losing several times to Jan, Suguru challenges him yet again in this volume. This time, the challenge is to see who can make the best viscera dish. Suguru has the advantage, as his unlimited resources allow him to import the best ingredients in the world. Can Jan, who can't afford the same ingredient quality, beat Suguru once and for all? I might have been wrong in labeling Iron Wok Jan! as a comfort food manga. Sure, you can casually pick up any volume, but if you do, it'll mean having to pick up the next one and the next one after that. I didn't realize how involved I was in the story until I reached the end, where I was confronted by the cliffhanger ending, which is how most volumes in this series end. Although it's not a life or death situation, I really want to know what happens next. Luckily, DrMaster releases this title on a monthly basis, so you won't have to wait long if a cliffhanger is driving you crazy. The manga goes to great lengths to get the reader involved. In this volume, you follow both Suguru and Jan as they prepare for their duel. Many trademark Iron Wok Jan! items show up, including unusual ingredients (past oddities have included frog fallopian tubes), the characters testing out different cooking techniques, and the over-the-top cooking 'battles.' Even if you’re not a chef, it's easy to understand and get excited about the matches. Most of the technical aspects of cooking are explained to the reader through other characters explaining it to the novice chef Okonagi. Although it’s a useful exposition tool, I'm starting to feel bad for the guy, who after twelve volumes of hearing "Okonogi, you don’t even know that?" must have the lowest self-esteem ever. The artwork in Iron Wok Jan! shows the various personalities of the characters through their appearance. Aside from acting like a demon, Jan looks like one as well. His eyes are angular and severally outlined in eye shadow, not to mention the fanged teeth and maniacal grin. Suguru is practically the opposite, with wispy blond hair and classic pretty boy looks. For the most part, the characters designs have been pretty consistent since the first volume, but it seems to me that the busts of Kiriko and Celine have gotten larger with each consecutive volume. Both were very voluptuous characters to begin with, but now it's gotten to the point where I wonder how they manage to see what they are cooking beyond their double Z sized breasts. The cooking scenes are paced well, although after a while all livers start to look the same. Part of the problem would be DrMaster's printing. Thin lines are faded, and the screen tones seem darker than what they should be. The printing is so bad that it distracted me from the manga itself. At least the translation is alright. If you like the series, then you'll enjoy this volume as it's more Iron Wok Jan!. If you haven't checked out this manga yet, then I highly recommend that you do. You might get addicted to the series and start craving strange foods after reading it, but those are only the mild side effects that come with reading this fun manga.